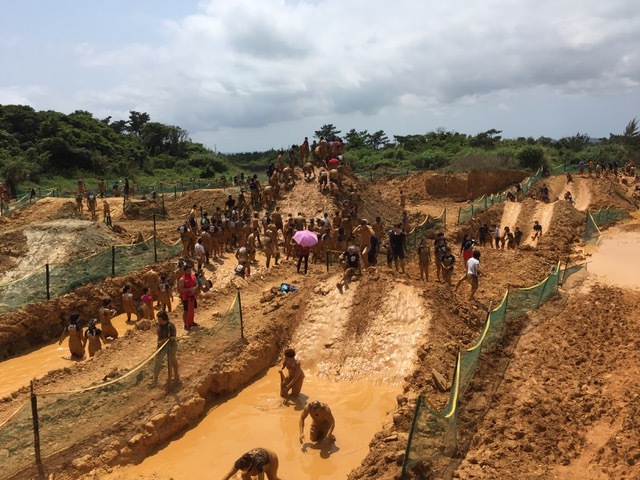 The Camp Hansen World Famous Mud Run is back and it’s grimier than ever! Everyone knows this is coming, so it’s time to come clean… The Camp Hansen World Famous Mud Run is back and it’s grimier than ever. On Sunday, Apr. 14, MCCS Semper Fit invites all SOFA personnel, and U.S. and Japanese citizens island-wide to join in on the dirtiest event of the year! Starting bright and early at 8:30 a.m. is the 3K Kids’ Fun Run. This course, open to children ages 9–14, features nearly two miles of off-road trekking interrupted by goopy trails, slippery hills and sloshy waters. There are wall climbs, hurdles and more fun challenges that will leave them breathless with excitement and talking about the exciting experience for months afterwards. Also at 8:30 a.m., the first heat of the 1K Kids’ Challenge starts for children ages 5–8. Though the course is mud-less course for safety, tykes will face a series of obstacles scaled to size on a grassy field that will certainly test their mental and physical abilities. There are wall climbs, hurdles and more fun challenges that will leave them breathless with excitement and talking about the exciting experience for months afterwards. Of course, kids aren’t going to be the only ones guilty of tracking mud through the car that day. Dirty laundry will be on full display throughout the 5K and 10K Fun Runs open to individual adult runners and 5K and 10K Competitive Runs for teams. Teams must consist of three people and all members of each team must cross the finish line together, so that nobody is left behind lost in a muddy pit. The 5K Competitive Run begins at 9:30 a.m. followed by the 10K Competitive Run at 10:15 a.m., the 10K Fun Run at 11 a.m., the 5K Fun Run at 11:45 a.m. and a second 1K Kids’ Challenge at 12:30 p.m.
After all the mud, sweat and tears, the action moves over to the Camp Hansen Parade Deck. There runners can reward themselves with all of their favorites from Shisa Pizza, Bulldogs Burgers and smoked BBQ from Hickory House, and celebrate their feats with games, entertainment and Fun Land inflatables for the young and young-at-heart! MCCS is also giving away tons of prizes and freebies, including two roundtrip tickets to any U.S. gateway city courtesy of United Airlines, a total of 17 overnight stays for two courtesy of Hotel Moon Beach, Moon Ocean Ginowan Hotel & Residence, Kafuu Resort Fuchaku Condo Hotel and Okinawa Grand Mer Resort; $1,600 worth of Nike apparel courtesy of BSN Sports, Red Lobster gift cards, entry tickets to Nago Pineapple Park and over $3,000 in prizes courtesy of Boingo, California Sunshine and Dydo Drinks. 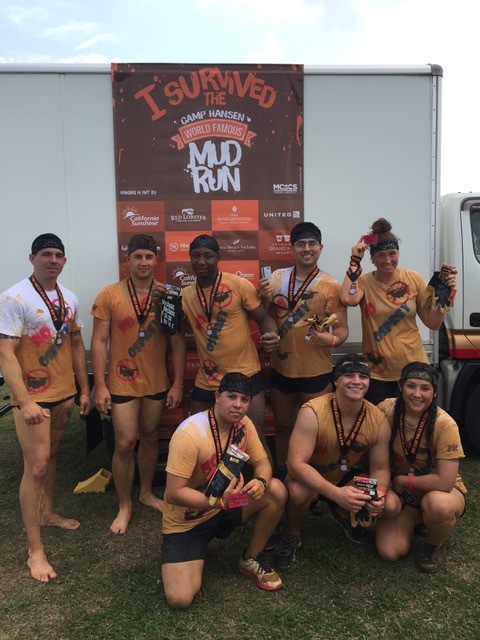 All 2019 Mud Run finishers will also receive a medal, FREE event t-shirt and event-themed towel. All 2019 Mud Run finishers will also receive a medal, FREE event t-shirt and event-themed towel. Special awards will be given to the top three male, female and team finishers in the 5K and 10K competitive races. Register at mudrun.jp, or in-person at Taiyo Golf Club or any staffed MCCS Fitness Center by April 12. Participation costs $10 for children, $35 for adults and $90 per team. For more information, email mccsmudrun@okinawa.usmc-mccs.org or call 645-3521/2 (098-970-4866 for Japanese).